You know where the best jerk chicken is in the world? At an amazing resort in Montego Bay, Jamaica where it’s smothered in delicious jerk seasoning and grilled fresh by the pool each afternoon! My husband and I ate this nearly every day on our honeymoon, because it was just that good! We still wonder why we didn’t bring a jar of the seasoning home with us, but I suppose that’s as good of reason as any to go back…right? 🙂When we got back from our honeymoon I did some searching on Pinterest for Caribbean jerk chicken I could make at home. 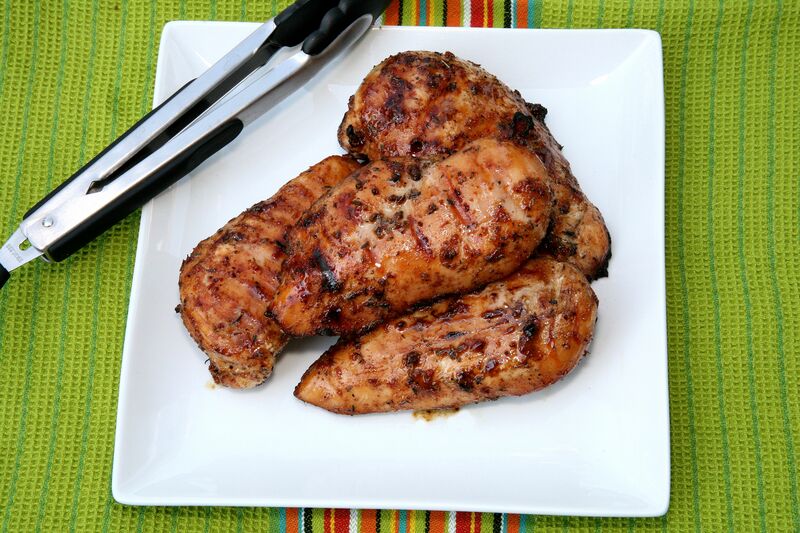 Have you ever looked up a recipe for jerk chicken? The real deal is a number of ingredients and steps and it may have slightly intimidated me for some reason. Although I do want to try making the ‘real deal’ at some point, I jumped at the opportunity of this simple version in the meantime. Seven ingredients, mix it all together, pour and marinate. Yep, I can handle that one! This quickly became a favorite dinner for my husband and I. It’s easy to make and has fantastic flavor! It’s good cooked in a skillet, baked in the oven or, my favorite right now, on the grill (no dishes to hand wash!) We typically serve it with brown rice and broccoli keeping some extra marinade (that was not touching the raw chicken!) to pour over the rice and vegetables. If you add a rum and coke and close your eyes, you just might fool yourself into thinking you’re in Jamaica for a minute 😉 Enjoy!! *You may double the marinade based on preference or if you want extra to pour over cooked chicken & dinner sides. Add all marinade ingredients to a mixing bowl and stir until well combined. Place chicken in a large Ziploc bag or baking dish and pour in the marinade. Allow to marinate for at least 2 hours. Cook chicken as desired (in cast iron skillet, baked in the oven at 350 or on the grill over medium heat) until internal temperature reaches 170 degrees. Serve immediately with your choice of sides.